What are the most significant natural hazard emergency management issues Australia faces over the next ten years? This was the question posed to the Australian emergency management sector in a series of workshops hosted by the Bushfire and Natural Hazards CRC between 2015 and 2017. These publications document the major research issues in natural hazards emergency management. They were considered and noted by the Australia-New Zealand Emergency Management Committee in June 2017. These research priorities represent the consensus view of industry experts and are based on extensive consultation and discussion. This is the first time an exercise of this scale focused on natural disasters has been conducted in Australia. It is the first time the collective knowledge of the industry has been drawn together and recorded in such a manner. By synthesising this information, it will be easier for researchers, policy makers and practitioners at all levels to plan and prioritise their work, to enable a nationally coordinated research capacity to address the major issues of our day and to support the uptake of that research into practice. These publications are the beginning of a process, not an end. A national discussion within the emergency management sector has identified themes for research priorities, but this is not intended as either a final or comprehensive list. As new themes and research priorities are identified in coming years, they will be included in this document, and published on this page. 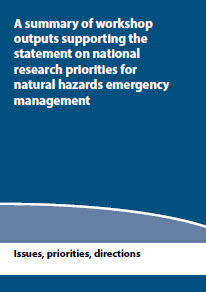 National research priorities for natural hazards emergency management - issues, priorities, directions. A summary of workshop outputs supporting the statement on national research priorities for natural hazards emergency management. A series of information guides for future research activities, individually themed around a workshop topic. Communicates research priorities for Australia identified by the emergency management sector for the decade 2017 to 2027. Promotes greater collaboration between researchers, practitioners, policy developers and funders. Contributes to building a strong and interconnected evidence base in natural hazards science, based on the highest needs of the sector. The outcomes presented here represent a consensus of industry experts and are based on extensive consultation - this is the first time an exercise of this scale focussed on natural disasters has been conducted in Australia. It is the first time the collective knowledge of the industry has been drawn together and recorded in such a manner. 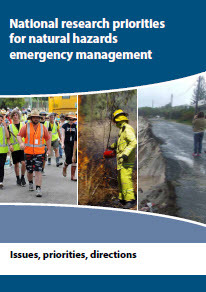 This publication collects the top level outcomes of these workshops and, in doing so, presents a broader set of national research priorities in natural hazards emergency management by identifying end user motivated national priorities across major themes. The workshops provided an exploration of major issues that would benefit from the support of research at a national level. There was no attempt to solve any of the issues or problems raised nor was there any discussion on the details of specific research.